One of my favorite things about my job is all the incredible people I get to meet every day. I sometimes feel like the actual task of helping people with their outer beauty is secondary to helping people realize their inner beauty. I tend to lose track during my initial consultation process because sometimes there is so much more to discuss. I know that business is for making money and that I should always be using my time to consult and define treatment, but alas I just can’t seem to step away from who I am. Today I met a remarkable young woman. She walked into the clinic and right away you could feel her positive vibes. A true beauty with long black, luxurious hair, deep, dark eyes and an amazing smile. I remember thinking I wonder what this girl is here for? I can usually guess the issue at hand from a quick glance. In this case I figured it must be laser hair removal because everything looked like it was perfect just the way it was. Anyway as soon as we got to sit down and chat Jane (not her real name) told me that her main concern was her skin. Jane has mild to moderate acne on her cheek area, some minor pitting and pigmentary issues from picking and potentially too much sun exposure. The interesting thing was the problem was pale in comparison to her beauty. I mean until she actually showed me I hadn’t even noticed (and I notice everything). This is not to say that she was imagining the problem, but boy was she super focused on these imperfections and absolutely unaware of how she actually presented. We got to talking about her options and of course for me that always leads to a little bit of getting-to-know you chat. Jane actually feels that at 21 years of age, her skin was the major factor in finding a boyfriend. I want to say I am totally shocked at this ridiculous position, but I’m not. I think this is an issue for a lot of women. Not the skin thing, but the way we overly focus on our flaws and understate our positives and the way we define ourselves. As I said when Jane walked in, my first thought was “WOW’ what a beauty! Even now I find myself hoping that in some way I was able to impact her to see what I and others see on first impression. The other side of this coin is of course and thankfully she seemed to be as extraordinary a women on the inside as she appeared to be the outside. What a wonderful combination! Shame that she didn’t necessarily agree. Do ‘I’ see myself the way the world perceives me? Unfortunately I would say a ‘resounding’ nooooo! But happily I have learned to enjoy the perception. It is much better to enjoy living in the glow of others rosy colored glasses instead of my view through my 20x diopter lens. I hope I imparted this to Jane today, because she definitely deserves it! 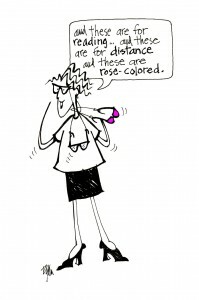 Task of the day, put on your rosy colored glasses and enjoy glow!!!! !